While I have been sitting and rocking my sick Freddie, I've been doing a little too much of surfing and blog-reading. Sometimes I will read home blogs and get discouraged - sometimes inspired. Been getting a little too much John and Sherry this time, I think. As I was sitting ans sitting and rocking, I spent a lot of time looking at my house, and noticing all those things that I mean to get around to sometime, but usually don't, and then I see those things so often that I don't see them anymore. Ya know what I mean? Well, I started noticing them again while I was sitting. And folks, we have a missionary send-off party that will be happening here in not a whole big heap of time, so maybe I ought to start addressing a few of those issues. And I thought, as I was putting these sick little little sweeties to bed, that I would just jump on one of these projects and git 'er done. Here is my awesome coffee table, which the kids love to do their homework on because the top lifts up and locks like a giant TV table. I partially roughed it up with some coarse sandpaper, because that's what the stain said you needed to do. I had to go over a few areas more to get out some long scratches that happened while the table was in storage. See the dark scratch? It has a few friends and they drive Trent crazy. So I'm doing him a favor, besides de-orange-ify-ing the whole thing. After some hard work and making my hands look deformed like the crazed arthritic witch from Snow White, I was ready to re-stain the top. I made sure there was plenty of ventilation, because the stain was very stinky. Wipe on, wipe off. Easy. And it looks great. It looks great if you like a very slightly darker orange color with dull brownish skid marks where I took out the scratches, that is. And one of the scratches is still there. So now I have more work to do to get it back to a presentable state. And this time, I can't just ignore it as something that would-be-nice to get done, because it looks bad. Really bad. And that, my friends, is how to make your own mess. Our house still stinks. I raised 5 boys and had no idea what a febrile seizure looked like. I knew what it was - rare. So I didn't worry about it. Then along came my second batch of kids, and I learned. Not long after Angel tried to fly out the window, cracked her skull to pieces, stayed in the hospital, got put back together, came home, and recovered... Whew. That was an ordeal. an now I can sum it all up in a single awkward sentence? You can read all about our miracle here. Anyway, after all that, I was driving the boys home from school when one of them told me that Angel was shaking in her car seat. We were almost home, so I pulled in the driveway before turning to look at her. She was having a seizure. Scared all the bejeebies out of me. I hauled her in the house and laid her out on the couch. She was still jerking and I just tried to keep her from falling or hitting anything. When it was over, we did some quick research. Grateful that we have so many answers at our fingertips! A febrile seizure is a whole-body shaking episode that occurs when a fever rises quickly. It has much less to do with the actual temperature of the fever as it does with how fast it comes on. And yeah, it's a full-out seizure: eyes rolling back, jaw clenched, spasms jerking, limbs twitching, lips turning blue. It can be really scary. Happily, I've never been a panic-in-an-emergency kind of gal, but that doesn't mean that I wouldn't like to scream every now and then. I just don't, is all. Due to Angel's recent head trauma, I wanted to take her in to the doctor. I called our regular doc, and they directed us to the urgent care clinic. It was a bit of a drive, and a long, long wait once we got there. An exercise in frustration, really, since after a long, long, really long wait in the examining room where we had to wait extra to get second and third opinions from doctors who must have been called in from the golf course to check our little girl - they sent us to the emergency room after all. More waiting, and more waiting, of course. That's what an emergency room is all about. By the time we were actually seen, Angel was fine, the fever had subsided, and she was climbing the walls like a monkey in captivity. We learned that febrile seizures were not a bad thing - they just happen to some kids. And if they have one, their chances of having another were greater, but kids usually outgrow them by about age 5. Since then, Angel and Georgie have both had a couple more seizures. On vacation, no less. But Freddie was spared, until this week. Welcome to the club, little Fred. I've spent the past few days just holding my little guy. He's been feverish and coughing, just not feeling well and wanting his mama. I've been sitting so much that Angel even called me on it yesterday. "Mom! You are just sitting, sitting, sitting! It is not healthy for you. You should get up and do something!" I'd love to, dear. I have medicines I need to refill at the pharmacy, and I need to go grocery shopping to refill our Mother Hubbard cupboards. The chickens are running out of food, too. And I have lots of things I'd like to get done. But until my baby gets feeling better, I'm just going to sit and rock him. That's what mamas do. During the day, it's my job to do the dishes. The older boys are all at school or at work, and I'm home with the three little ones. If the dishes are going to get done, it's up to me. Some days I just let the breakfast, lunch, then snack dishes pile up on the counter, knowing that whoever is on for dinner dishes will take care of them. Some days are not conducive to dishes-doing. 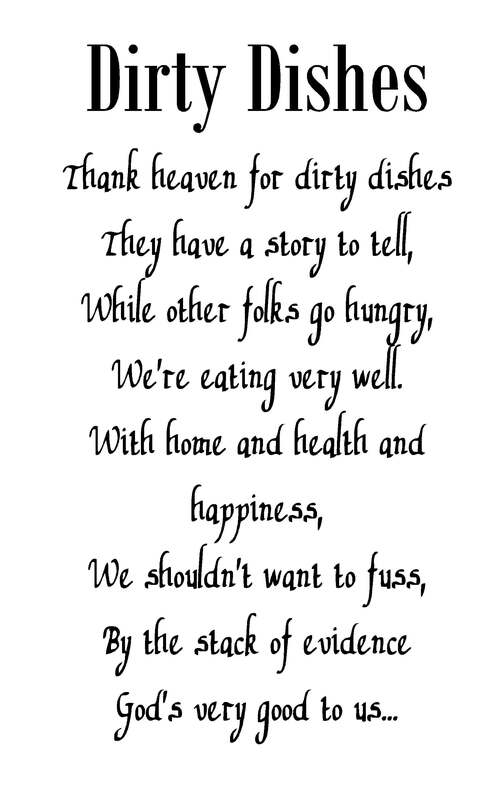 But most days, I like to get the breakfast dishes going and smile happily at my clean kitchen. It doesn't stay that way, so I have to smile quickly. If the dishwasher is full, I like to run it immediately because 1) the dishes get cleaner if they don't sit in their gunk for a long time; 2) then the dishwasher can be unloaded and ready for more dishes; and 3) because Trent and I have differing opinions on the proper way to load a dishwasher and if I get it run and emptied he will never know. We make allowances for each other like that. Unknowingly. Angel has become a good little helper for me, and thinks it is fun to unload a dishwasher. We want to encourage that delirium. She takes out the utensils and piles them in an orderly-to-a-five-year-old assemblage in the silverware drawer. She carefully stacks plates and bowls on the counter, waiting for a person of greater height to place them on the shelves. Then she dances like crazy about the kitchen, narrowly missing several collisions with the cupboards, gleefully proud of herself. If the dishwasher is empty, then I can, with a clean conscience, ask the boys to load their own dishes from after-school snacks. And the counters stay clean! In theory. And during the week. All the order in the universe shifts on the weekends. I walked into the kitchen late Saturday afternoon to see that, while the dishwasher was running, someone had made a peanut butter sandwich. Instead of opening the quietly sloshing dishwasher and adding the peanut buttery knife to the already-in-progress load, that someone had placed the knife on the counter to the right of the sink. I'm ok with that. But later, someone had made a ham and cheese sandwich, and neatly placed the mayonnaise knife and the cheese slicer next to the peanut buttery knife. Lined up like a dozen tin soldiers were a butter-and-toast-crumb knife, a spoon from an illicit ice cream robbery and three of his guilty friends, a pickle fork, a fork from leftover spaghetti, another butter-and-toast-crumb knife, and a spoon from hot chocolate happily making a miniature hot chocolate pool on the counter. After this police lineup were a few plates and bowls and cups, each needing to have it's very own space on the counter. No sharing or stacking for me, thankyouverymuch. I was amazed at how the parade extended past the sink area, past the dishwasher, and extended all the way down the counter before making a neat turn toward the stove. Memo to children and others living in this domicile: If you are going to go through all the trouble to place each utensil exactly parallel and equidistant to the one previous, and line all the dishes up in perfect marching band formation, at least play some Sousa while you do it! Or maybe just stack the dishes? I had a date with Alec. I had it all scheduled with the older school boys that they were to watch the small fry and get their chores done independently while Alec and I went off to do some shopping. We were going to get the things he needed for his mission. There is quite a list of things. Things. Alec needs to take with him. Things you take for granted until you have to pack for a two-year trip and you can only take two suitcases and a carry-on bag. And all those Things have to last and fit and work without failing. A suit, of course. Belts and ties and 10-14 pairs of socks. I think I might own 3 or 4 pair, but I'm not a sock person. Or a shoe person. But I digress. Lots of white shirts and a bunch of dress pants and waterproof winter boots and a good coat with a zip-out liner and sturdy walking shoes and towels and a sewing kit and gloves and an umbrella. I might have missed a few things. So we sat down to plan our strategy, Alec and I. I had recently chatted with a Very Smart Mother who is our neighbor (we are so lucky!) and has a son who just got home from a mission and another son who is currently serving. She gave me some recommendations on stores to go to and brands that were sturdy and stores we might want to skip. I relayed these comments to Alec, and we headed to the computer to do a preliminary comparison of prices, just so we would know what we were getting into. We opened lots of tabs on our browser, comparing back and forth... and then we found a sale. A sale with white shirts marked more than half off. A sale with buy-one-get-one-free. A sale with free shipping. And before I knew it, the mother-son bonding trip I had so been looking forward to had turned into me looking over his shoulder as he clicked scrolled and added things to his shopping cart. Mostly, he shopped and I fielded all the normal random questions and concerns from the rest of the children. Not a shopping trip. Not one-on-one. Not bonding. Sigh. But really, what is the important thing? That we are getting the things that he needs. And that I love him. And he loves me back. So proud of this boy. So proud of the man is is growing into. I'll love him forever (even if he doesn't want me to sometimes). I'm looking for peace. Have you seen any? I heard there was a sale on the 15 oz can at the local grocery store, but then I read that something in the attempted preservation makes the peace evaporate and go sour. I'm anxious to find some. As I'm typing, none of the kids have done their chores. The twins are at the counter, backwashing in their hot chocolate. One of them will spill any moment now, I'm sure. Angel is moping around, wrapped in her favorite quilt, complaining in a very whiny voice about how there is a hole that goes "clear through." What do you expect of a blanket that gets dragged everywhere? David and Eddie are reading library books instead of doing their homework. I don't see Chris or Ben, which probably means that they are doing thoroughly unproductive things on their personal distraction devices. Alec and Trent are gone at work, like always. And me? I'm writing when I should be doing a thousand other things. There's a load of laundry begging for attention. The box of wooden blocks just got upset all over the living room floor, waiting to trip me up as I dash across the room barefoot. I still haven't ordered new checks. I forgot to get the main item for dinner when I was at the store. I need to make dental checkup appointments. My own bedroom is a disaster. The family budget needs a tuneup. I'm teaching a lesson in church on Sunday and I'm not as far on the text as I would like to be. And the taxes! Always, always a million things to do and hardly the energy to think about them, let alone get things done. And where is a gal supposed to find peace in all this? It's all in the way you look at things, and what you decide to put in your heart. People can feel uneasy and have fighting thoughts when there is no outer conflict. Others can have calmness and a deep serenity even in the middle of war. Jesus was called the Prince of Peace, even though he didn't do anything to alleviate the political oppression of his people at the time. But he taught them how to find peace in their hearts. So, amid all the unfinished chores and heavy responsibilities, I can find my peace. The winter sun is slanting into the room through handprinted windows, filling warm puddles on the floor where David lays, reading a book. Eddie is generously sharing his pretzels with Freddie. Angel dances with her blanket, wrapping herself in the warmth and love of a quilt handmade by her cherished grandmother. Georgie climbs into my lap, content to snuggle for a few minutes before dashing off to some new adventure. Ben bends his curly red head over his iPod, concentrating on his homework, focused on maintaining his GPA. Chris gives me a wide teen-aged grin as I walk past, lighting up my mother heart. It's a beautiful day. It's a beautiful life I have here with this family. And my heart fills with peace. I've been waiting. Waiting to write, waiting for life to settle down, waiting for my turn at the computer, waiting for a quiet moment, waiting for my memory card. Waiting until inspiration hit, until I was less tired, until I felt I had something important. No, I'm sure some of those things will happen. The kids will be done with their homework and free up a computer eventually. Life is quieter in the evenings. My memory card and the pictures on it will be returned eventually. I will get good ideas. But they won't all line up at the same time. I'll get a flash of something I want to write about just when someone needs help on the potty. When the computers are free will be when I am too tired to think straight. Life will settle down when my children are grown and the memories of them will be lost. But all of the variables will never be lined up just right to make it the perfect time to do things. So I'll quit waiting, and jump right back in. 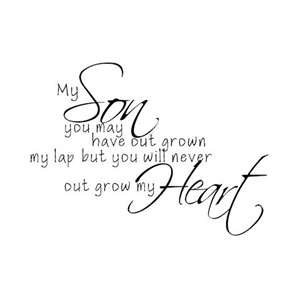 As I sit and write this, I've already had a tattle, "Mom! Freddie is eating the flour!" "No I'm not; I'm just tasting it." Angel keeps asking me to help her write a little thank you letter. And I just noticed that the twins were too quiet near the heat vent. My inquiry as to what they were doing was responded to with two adorable and somewhat guilty smiles and "We are not putting these (holding up small toys) down the heater?" Today I will order new checks. I've been putting that one off, too. I will take my dad to his new Tai Chi class that we finally got around to starting last week. And that will be enough new things for one day, mixed in with all the other things that I do manage to fit in. Try delaying dinner when you have three ravenous teenaged boys, two hungry pre-teen boys, and a small handful of grumpy pre-schoolers! That's not one that can wait. What are you waiting for? Oh, and it's good to be here again. It was spaghetti day, just like the menu said. At the end of last week, I sat down all the boys, or as many as I could get to sit still for a while, anyway. "What do you want to be eating for the next week?" was my demand of them. They grunted. Two of them had eyes glued to their personal distraction devices, and two more were watching over their shoulders. Great. No one wants food. I'm ok with not cooking! Slowly, I got a few answers. Pizza. Tacos on Sunday, of course. Ramen. Pizza. No rice. Pizza. I continued to talk with them and encourage, until we had a one-weeks menu consisting of breakfasts, packable lunches, snacks, and dinners. It was good to get their input, because it's hard for me to come up with lots of ideas. Also, it means that they can't complain about what we are eating because they helped plan it. I got some good suggestions, too. Like varying the ham-and-cheese-sandwiches-lunch that we make most mornings. And having bigger snacks. And making bread sticks with spaghetti. So come spaghetti day (it was Monday, because we always have pasta on Mondays. Somehow Mondays need an easy meal like pasta. ), I scoured Pinterest for easy bread stick recipes. I found lots - of other things. <sigh> I looked other places that weren't so addictive, and came up with an attractive option here. They looked yummy, simple, and didn't have an ingredient list longer than my arm. I get nervous about eating foods which contain words I can't pronounce. Somehow if the word can't make its way out of my mouth nicely, I don't think it can go in very nicely, either. So I put on the apron that Fred and George made for me on Mother's Day and started mixing. I used my very best cheap metal measuring spoons. I sifted and scooped flour. I drizzled on the butter and sprinkled in the salt with a practiced flick of my wrist. Me and the Pioneer Woman were twins in Heaven, I'm sure. And our little brother was Alton Brown. Yup, I was channeling my inner Food Channel to make the most delectable bread sticks my boys have ever inhaled. The dough mixed up nice and smooth, despite the fact that I used nutritious freshly ground whole wheat instead of that inferior store-bought white powder. I popped the dough ball into the oven and warmed it up just a scosh so it would rise. Turning my attention to other things, like the marinara sauce and the tossed green salad, I thought I was doing so well. Look at me balance cooking a three-course dinner AND encouraging homework AND supervising the boys and their household chores AND settling arguments! Never mind the fact that I just spelled half of those ANDs as ADN. Never you mind that. I might as well put on my pearls and heels and slide on a smear of lipstick! And then I smelled... baking bread. Wha...? I forgot to turn off the oven after I turned it on to warm the dough. Instead of letting the dough rise, I was baking... a very lovely, round dough ball. Drat. So much for my homemaker of the year award. Oh well. The bread ball was still tasty, as we cut it into slices and dipped it into a highbrow mixture of balsamic vinegar and olive oil. Everyone walked away from the meal satisfied - just like they would have been if the bread had been stick-shaped instead of ball-shaped. And I have a new challenge for next Monday night. Bread sticks. Because my hungry boys need a new shape to inhale. Trent finally quit his job, and the sun shone and angel choruses sang. Maybe that was just me singing. Let me back up. Trent's job got a bit unsettled several months ago when they "restructured" the pay scale. Messing with the pay scale is a big deal when you are working a job that is commission-only. <Trying not to grumble.> Turns out that the increased bonuses did not even begin to cover the decrease in per-sale income, and the sales were spread thinner so each worker earned fewer. It was a change that would be fine for a single man, but not for one who had other mouths to feed. Trent started looking for a new job. After a while, and many prayers on my part, he was recruited to a better position with a smaller company. The division was new, so Trent continued to work full-time (60+ hours a week) at the old job while starting up the program at the new job. Now he was working full-time at two jobs. We rarely saw the busy man. Weeks went by. I finished our family Christmas cards, passed out pens so everyone could sign them, addressed envelopes, and mailed them out. Then I pasted the card on Facebook. Minutes later, Trent asked me in surprise, "Did you just post that out for everyone to see?" Why yes, I did. And I thought I had done it with his blessing...? There was a slight problem. There always is, isn't there? In the card, I mentioned that Trent had gotten a job offer at a new company. But he hadn't put in his notice at the old place yet. Not wanting to get him in hot water, I hastily deleted the post, but not before lots of holiday social media friends had seen it. Just after Christmas (where he got an entire day off! Woot! ), Trent finally, finally! gave his notice of quitting the old job. He continued to work long, long hours at both jobs for the next two weeks. What a blessing it was, this extended goodbye to the old job. It put his last day in January rather than December, giving us another month of employer-paid health insurance before we have to find our own (the new job has no benefits). Last weekend we had our first Saturday with Trent at home in more than a year. It was wonderful to have him around. He spent the day playing with the kids, taking the boys out for haircuts, and teaching the little ones how to make armpit farts. Happy family quality time. It's been nice to have him home earlier in the evenings. He gets off at 7 now, instead of the 9 or 10 or later (past midnight sometimes!) of the old job. We've missed having a dad at home. Ben burst into the house after school, with an enormous grin splitting his face. "Mom! I did it," he exclaimed, slightly out of breath with his enthusiasm. "I've mastered the doughnut!" The boys only wish they had a Mustang to drive! It has been snowing pretty steadily over the past few days. It has been cold, but today is a smidgen warmer. The lower levels are melting a bit, so the pileup tends to be slushy on bottom and powdery on top. The roads are, understandably, slick. It is always a challenge to drive on slick, snowy roads; not for the weather conditions so much, but for the other drivers who don't know how to drive in those weather conditions. Growing up by a university, I noticed that the first snowstorm was always the most dangerous as out-of-town college kids grappled with a new set of driving rules. When I married Jay, he taught me how to drive in the winter, Alaska-style. He would even pull into a big parking lot and drive our '67 Mercury Cougar into the only parking stall left: the half-stall next to a large snow berm. He'd rev the car with a wicked grin, plowing it up and onto the berm. I'd get out of our '67 Cougar on the downward side, and he'd climb out the top - at a 30 to 40 degree slant. If you learn to drive in the snow, it isn't very scary. Still, be smart. Ben went to the church parking lot on the way home to practice his skids and 360s in fresh powder without any other cars around. Learning how to handle the vehicle in a slide is a very worthwhile skill. And for a teenager, oh so fun! Wow. It's been a while, huh? We got the Christmasing and holiday-ing done and cleaned up. the kids are back in school. I even trimmed my getting-frightfully-long-but-very-feminine nails so I could type without using my knuckles. No more excuses to not get back into writing. And if I can, I'll do a bit of catching up with our festivities. I heard that the first Monday back to work after the holidays has been shown to be the most depressing day of the year. I'll bet the rest of the week isn't much better. Part of that, I'm sure, has to do with not feeling well from all the junk we consumed. Another part, for me, is the letdown of not-much-to-do after the crazy busy of December. This year, however, we have plenty to do. Less than three months from now, Alec is joining the ranks of an LDS missionary. It's high time we start getting him ready. I probably should do a few posts on this - the whole process of getting a boy ready to be a missionary - just because I'll be doing it a few times. Seven, to be exact. I'll let the preliminaries occupy other posts and we'll just talk about suits here. My boys haven't normally worn suits. A full dress suit is just a bit too expensive of an item to purchase for a boy who is expected to grow out of it in three weeks or less. Or blow out the knees. One of my favorite aunts (bless you, Aunt Shirley!) bought suits for the older three or four boys for Christmas one year. As it turned out, that was the year Jay died just before Christmas, so they wore them to the funeral. They looked splendid. 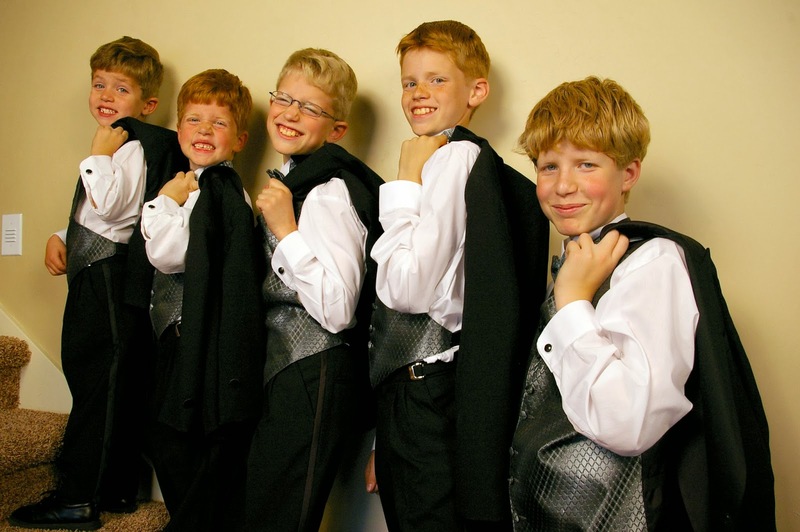 Years later, when Trent and I married, we outfitted the five boys in tuxedos for the wedding. Dashing. The pictures of my little (and getting-bigger) boys in a row of tuxes are some of my favorite memories. But since then... they wear white shirts and dark slacks to church. I will mention that we have a closet full of formal wear, as some of the boys have had to purchase tuxedos for choirs and bands they have performed in. We have quite a collection of tux pants and jackets in different sizes, as well as ties and vests and cummerbunds. It saves us a lot of money come Prom and Homecoming time! And I love seeing my boys all gussied up. So handsome. It's almost too bad they can't wear a tux on a mission! The local elders came by while we were taking pictures for Homecoming last fall, so here is the range of man-dress from Sunday best and Tuxedo pants to missionary attire. They're all handsome! Alec does have a hand-me-down suit from a cousin, but he's really gotten too broad in the shoulders for it to be a good fit. Suit shopping is now on our list of things to do. As a little bit of preliminary research, here are some things about suits that we need to know. This is the look we're aiming for: well-groomed and conservatively-dressy. A little bit more modern and trendy than the conservative look we're after, but some good guidelines here. 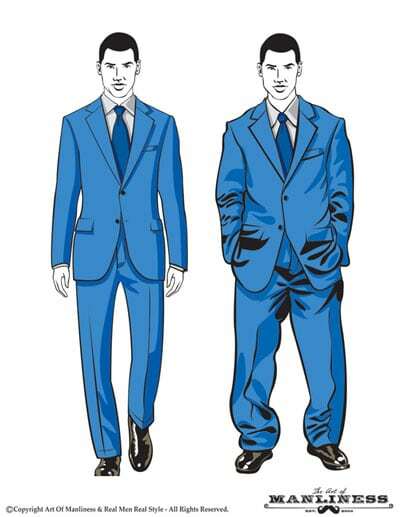 A good guide to what a well-fitted suit looks like, from the ever awesome Art of Manliness. 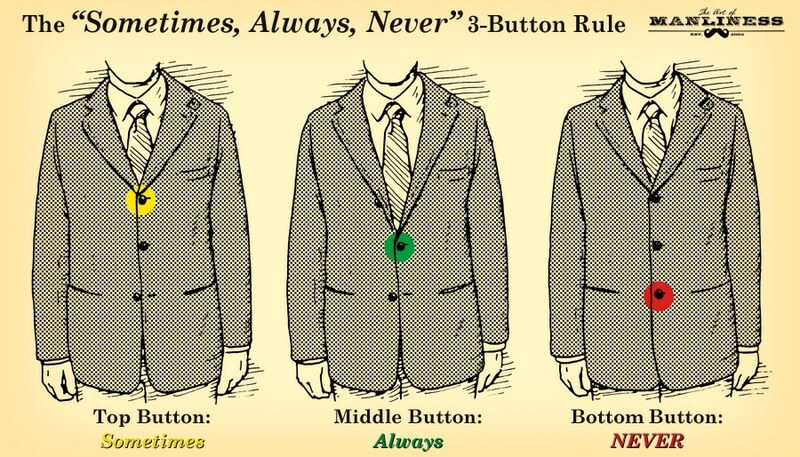 Good way to remember which buttons get buttoned and which don't. And of course, we need to know how to tie the necktie to go with the suit. We find the Four in Hand to be the easiest for young boys to master, but makes too small of a knot for older guys. Ben has to stick with this one to conserve tie length. The Windsor is a great looking knot, but makes for a much shorter tie when you are done - bad for our tall boys. I'm partial to the Half Windsor. I haven't been familiar with the Shell, so we'll have to try it! 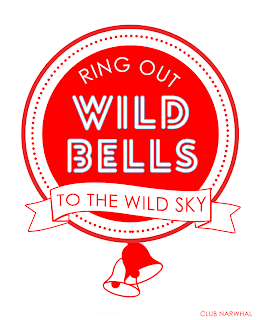 And you thought I was done with the Christmas carols? Surprise! 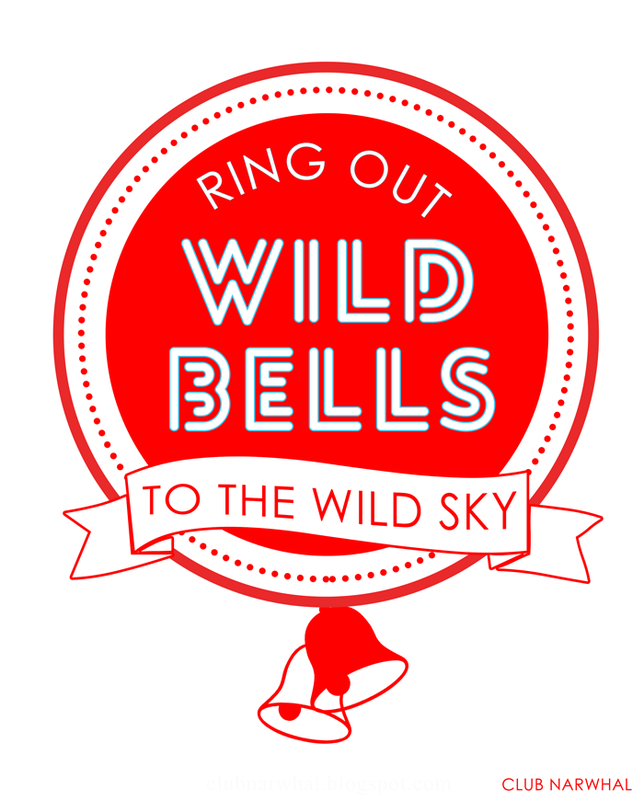 Actually, this one isn't for Christmas - it's a New Year's song about ringing in the new year. Thanks again to Club Narwhal!